Battle Hymn is Compass Games' new brigade-level system for medium to large American Civil War battles. 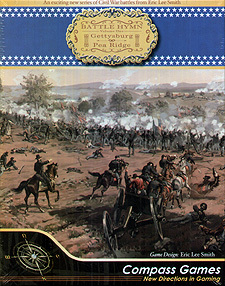 The designer's previous game on this topic, Victory Games' Across Five Aprils was nominated for Best Pre-20th Century Wargame. Battle Hymn expands upon that game and retains its basic simplicity. Battle Hymn includes an innovative combat system that elevates realism, while at the same time making it less luck prone and more fun to play. Gettysburg: The Tide Turns. It is the largest battle ever fought in North America and it resulted in a strategic defeat for the South. It could have gone the other way. There are no "idiot" rules in the game. You have your army, you control it, can you do better than Lee? Can you stop Lee? There are six scenarios: Day One, Day Two, Day Three, and the Campaign Game, plus smaller scenarios for Pickett's Charge (3 turns), and Little Round Top (3 turns). The smaller scenarios can be played in an hour, Days 1, 2, and 3 take three to four hours, while the campaign can take much longer, though it may end early. Pea Ridge: Missouri is Ours! This was the largest battle fought west of the Mississippi River. If the Confederates win, it is likely that Missouri will join the Confederacy. It was fought over two days, with the Confederates circling behind the Union and launching a surprise attack. What could go wrong? For a start, they had three days of hard marching, it was freezing cold, and they left their supply wagons over seven miles from the battlefield. Even though the Confederates outnumbered the Union 3 to 2, they lost decisively. But it could have gone the other way. There are no "idiot" rules in this game either. There are four scenarios: Day One, Day Two Retreat, Day Two Stand, and The Campaign Game, lasting from one hour to five hours. Innovative combat systemwith two combat Rounds per Combat Turn, based on recent historical research and the best practices used in miniatures games. Chit-pull system but the player with the initiative - if there is one - controls when his Combat Turn occurs. Movement is by chit-pull, making it harder to create perfect plans. High solitaire playability. Due to the Chit-pull system, plus the use of "At Random" rules to make important decisions, the game is excellent for solitaire play.